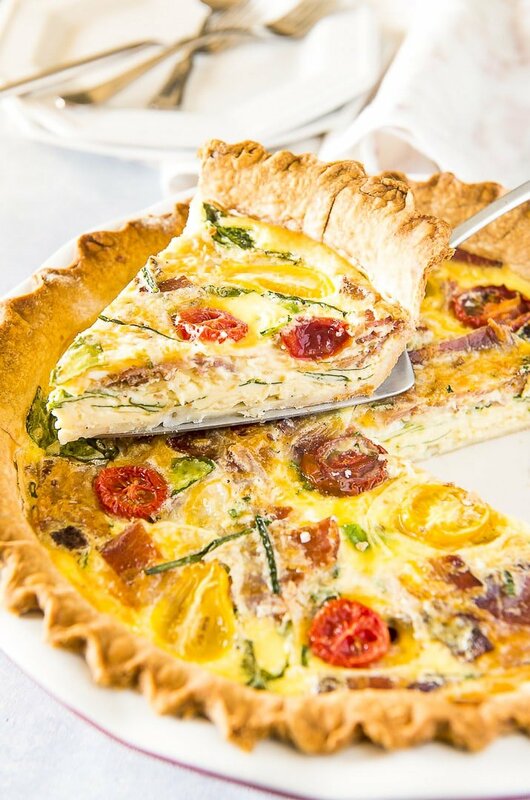 This hearty, crowd-pleasing Bacon Onion Spinach Quiche Lorraine only looks fancy! The preparation is beyond simple, but the final product is sure to become your new favorite breakfast dish! Every good cook needs a solid quiche recipe in their back pocket! 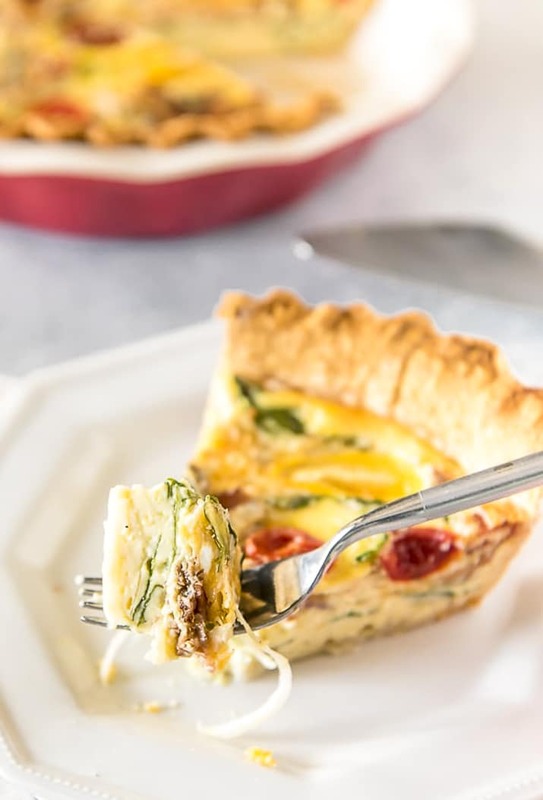 Quiche Lorraine is one of the easiest, tastiest breakfast recipes you could possibly throw together, and you very likely have the ingredients for one in your fridge at all times. 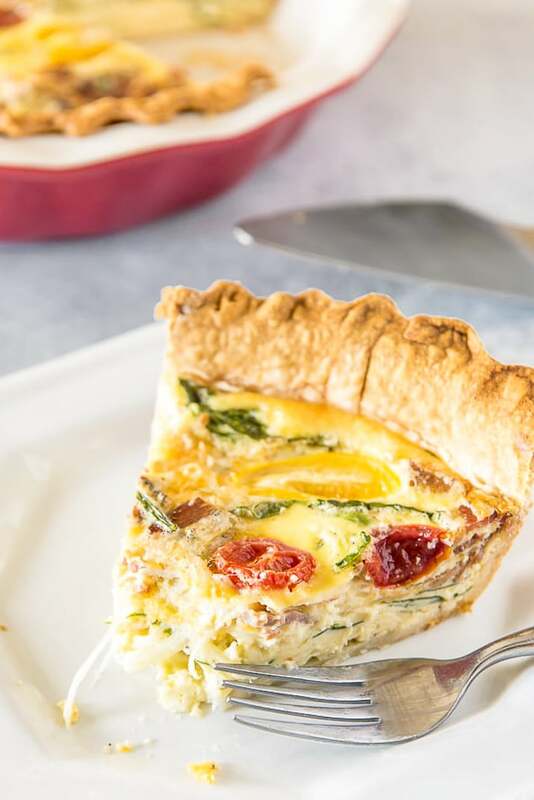 This Bacon Onion Spinach Quiche Lorraine recipe is just one variety of this popular French cuisine. Feel free to use the base recipe and add any vegetables or cheeses you happen to have. 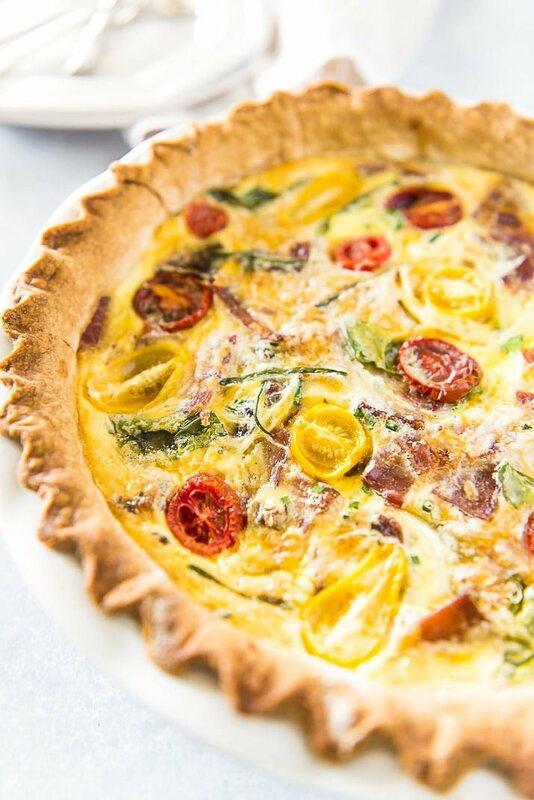 It is a savory tart that originated in France and is made from eggs, meat, cheese, vegetables, milk, and spices in a pastry or pie crust and baked. It has a custard-like consistency and can be served hot or cold, usually for breakfast or brunch. It is the original French version of this delightful dish and always includes BACON! Over the years other ingredients have been added in, but as long as you have lots of bacon and a butter crust… it’s Lorraine! How To Make Quiche Lorraine? VERY easily! 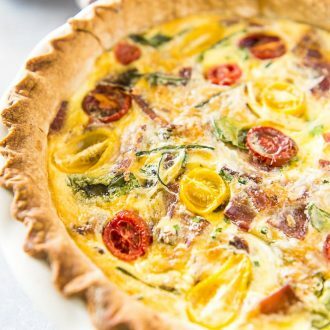 I love that quiche is one of those dishes that looks super sophisticated for very little work! Especially considering it’s one of the best ways to use up leftover meats, cheeses, and vegetables! While the crust is baking, whisk together eggs, half and half, herbs, and Parmesan cheese in a large bowl. Season with salt and pepper. Next, layer the onions, bacon, and spinach (or whatever you’ve got in the fridge!) in the bottom of the pre-baked pie crust, then top with Monterey Jack cheese. Pour the egg mixture on top and mix gently if needed to loosen the contents from the bottom of the crust. Then, garnish with grape tomatoes, more chives, green onion, sea salt, or whatever you’d like! Next, you’ll mold a long strip of foil around the edges of the crust (or use a crust shield) to keep it from browning too much during baking. Finally, bake for 35 to 45 minutes until the egg mixture is set. Then eat up, cold or warm! This quiche recipe is just as welcome on a random Sunday brunch in June as it is on Christmas morning. The large size is perfect to feed a crowd since you can slice it to any size and serve it with other breakfast fixings as part of a complete meal. No crowd? This dish can be enjoyed for three days from the refrigerator. You could also split the filling, use smaller pies pans, and freeze one, unbaked, for the future. Pin this Brunch Recipe for Later! 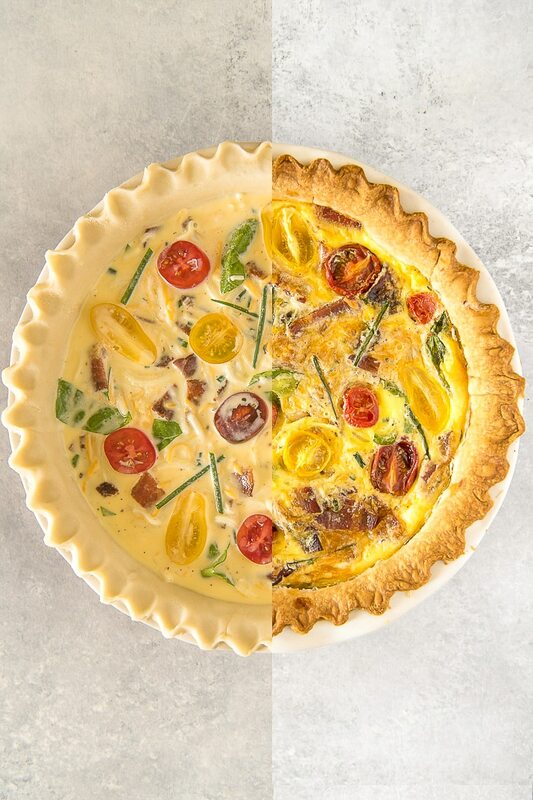 This hearty, crowd-pleasing Bacon Onion Spinach Quiche Lorraine only looks fancy! The preparation is beyond simple, but the final product is sure to become your new favorite breakfast dish! Feel free to sub ingredients for any leftovers or scraps in your fridge for a different flavor every time. Place the pie crust in a 9-inch deep dish pie pan. Poke the bottom with a fork, then pre-bake the crust for 10 minutes. Place the eggs in a large bowl and whisk until combined. Whisk in the half-and-half gradually until well combined. Add the herbs and Parmesan and whisk well. Season with salt and pepper. Layer the onions, bacon, and spinach in the bottom of the pre-baked pie crust, then top with the Monterey Jack. Pour the egg mixture on top and mix gently if needed to loosen the contents from the bottom of the crust. Top with sliced grape tomatoes and more chives, if desired. Mold a long strip of foil around the edges of the crust (or use a crust shield) to keep it from browning too much during baking. Bake for 35 to 45 minutes until the egg mixture is set. Cool, then cut into 8 wedges and serve. I love quiche for any meal of the day. So many goodies packed in here! Perfection! I’d make it for supper and pack leftovers to take to work the next day….that is, if I don’t eat them for breakfast!